HOW SAFE IS BIO SCULPTURE GEL ? Health and well being for both Therapists and Clients is what is important to us. Bio Sculpture is the only nail care company worldwide to receive a 5 star safety rating for tolerability and efficacy. WHAT’S INVOLVED IN REMOVING BIO SCULPTURE GEL ? Bio Sculpture Gel is removed in minutes with a specially formulated Soak Off solution designed to remove the Gel, without damaging or dehydrating the natural nail underneath. A small cotton pad soaked in Gel Remover and placed directly over the gel, the fingertip is then wrapped in foil. After approximately 10 minutes the gel will peel off the nail, leaving a beautiful healthy nail underneath. Bio Sculpture Nail Polish is removed with Bio Sculpture Non-Acetone Nail Polish Remover. Bio Sculpture Nail Polish can be painted over the Gel for an instant colour change, it can then be removed easily without damaging your Bio Sculpture Gel manicure underneath. WHAT SHOULD YOU LOOK FOR WHEN CHOOSING A SALON FOR BIO SCULPTURE ? Always choose a Bio Sculpture Therapist that holds a Bio Sculpture Certificate of Merit, Advanced Certificate or A-Grade Certificate. This is the only way Bio Sculpture can guarantee and ensure you will receive an authentic Bio Sculpture treatment. All technicians that have a Certificate of Merit have been assessed by a trained Bio Sculpture Educator to ensure the quality of their workmanship. Make sure the salon is using Bio Sculpture Gel, as often clients have been mislead and had acrylic gel applied which cannot be soaked off. I AM A NAIL BITER WITH VERY SHORT NAILS AND I HAVE A SPECIAL OCCASION COMING UP AND I WOULD LIKE TO GET MY NAILS DONE. If possible have a Bio Sculpture overlay applied approximately 5 weeks prior to the occasion. The Gel will actually protect the free edge of your natural nail and prevent it wearing away; you will be amazed how quickly your nails appear to be growing. In fact this is just that they are not breaking and wearing away. You will slowly, naturally become accustomed to the new length as your nails grow. If you are a chronic biter or picker, the temptation to pick will be far less if all 10 nails are instantly lengthened. The first infill should be done within the first two weeks, if the desired length has not been achieved within this time, sculptures can then be added. I SWIM 2 – 3 TIMES A WEEK IN A CHLORINE POOL, WILL THIS DAMAGE THE GEL ? I HAVE ANOTHER BRAND OF TOP COAT, WHY IS IT NOT RECOMMENDED THAT I USE IT ? We highly recommend you use the Bio Sculpture Top Coat. Our top coat has been specifically formulated to protect the surface of the Gel from absorbing every day substances that can damage and stain the Gel. You will find that another brand of top coat, can cause discoloring or even soften the Gel, this is due to a chemical reaction between the top coat and the Gel. I HAVE BEEN USING ANOTHER BRAND NAIL POLISH REMOVER TO REMOVE MY BIO SCULPTURE TOP COAT BEFORE REPLACING IT AND THE GEL IS STARTING TO FEEL SOFT AND IS LIFTING AROUND THE CUTICLE AREA. WHY IS THIS HAPPENING ? MY NAILS APPEAR TO HAVE FINE CRACKS ON THE SURFACE, HAS THE GEL CRACKED ? With a fresh overlay the Gel can be quite flexible, and Top Coat is not as flexible as the Gel. Occasionally newspaper print or grime can get into these tiny crack and very small crazy cracks appear. Remove your Top Coat with Bio Sculpture Non-Acetone Nail Polish Remover, wash your hands and then apply a fresh coat of Bio Sculpture Top Coat, to bring back the high shine and remove the cracks. I’M A HAIRDRESSER AND HAVE WORN OTHER NAIL SYSTEMS BEFORE AND FOUND THAT THEY ALWAYS CAME OFF. Bio Sculpture Gel works well on Hairdresser’s nails. The Gel is flexible and very durable in water, which is perfect for Hairdressers. Colour Gel is best as the staining from the hair dye will not show. IS IT EASY TO CHANGE MY NAIL COLOUR ? Should you wish to change the colour of your nails, you can choose from one of the 170 different colour nail polishes available and apply it over the top of the permanent colour gel. The polishes can easily be removed with Bio Sculpture Non-acetone Nail Polish Remover taking you back to your original permanent gel colour. It is highly recommended that you only use Bio Sculpture Nail Polishes and Non-Acetone Nail Polish Remover as they are specially formulated for our gels and will not cause any softening or lifting which other products can cause. WILL BIO SCULPTURE DAMAGE OR DEHYDRATE THE NATURAL NAIL ? There is no abrasive preparation, no priming or dehydration and very minimal buffing so the natural nail should not be dehydrated or damaged. DOES BIO SCULPTURE USE ANY PRIMERS, BONDERS OR DEHYDRATORS ? 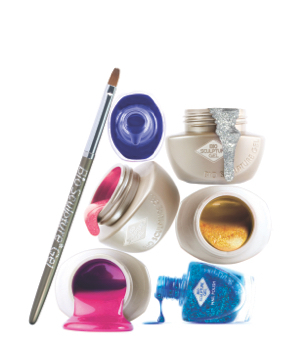 When applying Bio Sculpture Gel no primers, bonders or dehydrators are used. Bio Sculpture Gel contains no Formaldehyde, Toluene, Acetone and Phthalates and will give you a natural looking finish without damaging the natural nail underneath. IS THE UV AND LED CURING LAMP SAFE TO USE ? We have had our lamps tested by The Australian Radiation Protection and Nuclear Safety Agency. The Safety Agency have confirmed that the UV emissions of the Bio Sculpture Unit are predominately in the UVA region and our lamps are safe to use for the application of our gel as long as you do not exceed a maximum of 75 minutes per session. However, curing of the gel applied to finger and toenails will require much less than the maximum exposure time and should not constitute a risk. I AM GOING ON HOLIDAY AND WAS WONDERING HOW LONG DOES A BIO SCULPTURE MANICURE OR PEDICURE LAST ? Bio Sculpture will last three weeks on your nails and about six to eight weeks on toe nails, as they grow a lot slower than finger nails. Some clients may last longer as they look after and maintain their nails well and others client who are hard on their nails may only last two weeks. It’s recommended to re-apply Bio Sculpture Top Coat more regularly while on holiday to protect your Gel nails from sun cream and chlorinated water. HOW DOES BIO SCULPTURE GEL WORK ? Bio Sculpture is applied directly over the natural nail, much like a polish and mimics the natural movements and flexibility of your nails, keeping nails perfectly protected with a non-chip colour finish. There is no drying time with Bio Sculpture as it is cured under a Safety Tested UV fluorescent or UV LED lamp. There is minimal buffing to prepare the natural nail and there are no primers, dehydrators or pH balancers needed. WHAT IS THE DIFFERENCE BETWEEN BIO SCULPTURE AND OTHER GEL SYSTEMS, ACRYLICS OR HYBRID POLISHES ? Bio Sculpture is a very different product to other gels and hybrid gel polishes, the main difference being that Bio Sculpture will not cause any damage to the natural nails. Most gel systems on the market are acrylic based and cannot be removed without damaging the natural nail. The other difference of our system compared to others on the market is that there is no need for primers or dehydrators in order for the gel to adhere to the natural nail. The new hybrid gel polish formulas are somewhere between nail polish and Bio Sculpture Gel. They last a lot longer than regular nail polish, but not nearly as long-lasting as Bio Sculpture. At Bio Sculpture we are very proud of our unique, acrylic free formulation that see clients maintaining healthy nails whilst still being able to wear a nail enhancement or non chip manicure. We can provide gel sculptures, for those looking to lengthen the nails, problem nails and repair broken nails, offer unique nail art and add strength to nails, which the hybrids nail polishes are not able to offer as yet. CAN I HAVE NAIL ART APPLIED TO MY BIO SCULPTURE GEL NAILS ? Yes, nail art can be applied giving lots of different effects and finishes to your gel nails. Bio Sculpture offer a complete range of nail art including gems, studs, foil, feathers & glitters. Bio Sculpture Gel allows for nail art to be embedded into our gel, therefore lasting as long as your gel nails. For nail art ideas please follow our social media via the top right corner of the page. CAN I HAVE NAIL ART APPLIED TO MY BIO SCULPTURE GEL NAILS? WHAT IS THE DIFFERENCE BETWEEN UV AND LED ? Bio Sculpture now offers LED Gel curing as well as UV. The main difference between LED and UV is LED has a faster curing time, giving a firmer, brighter finish. ARE BIO SCULPTURE GEL PRODUCTS TESTED ON ANIMALS ? NO. We do not utilise the practice of animal testing and trials of our products on animals. All trails and testing are being done on human nails and skin. We source ingredients for our products through the highest quality standards possible to make sure that we don’t use ingredients that are not Safety Assessed and accepted by the European Commission Regulation 1223/2009/EC. WHY DOES MY THERAPIST CONTINUALLY SOAK OFF RATHER THAN INFILL? WHICH IS BETTER? There is no hard and fast rule with regards to soaking off every time against doing infills. Some nail technicians prefer not to do infills and rather soak off and put a fresh set of gels on, while others prefer to do a few infills before soaking off. Both ways are acceptable and used widely. The advantages of soaking off each time allows the technician to assess the nail plate and reapply Vitamin Dose and Executive Base promoting a healthy nail.